Situated on the north coast of Crete, Malia's appeal revolves around fun, sunny days and steamy nights of partying. Hotel complexes, tavernas, cafes, kiosks and shops remain busy during peak season. At night, visitors will find bright lights and pumping music in Malia's many cosmopolitan pubs and clubs. Sun chasers can enjoy a few glorious miles of sandy beach and clear water. Krasi village offers a scenic alternative, with its wooded slopes and rushing springs. Otherwise, the 2000 BC ruins of Malia Palace make for a wonderful excursion. Visitors can expect Greek resort shopping, where purchases include flip-flops, sunscreen, jewellery and leather goods. Ceramics, embroidery and other handcrafts make good souvenirs. Foodies should try the local wine and cheeses. Visitors can enjoy anything from traditional Greek food, to a quick pasta or take-out burger. Malia's nightlife has a reputation for being one of the Mediterranean's hottest for young clubbers, on a par with Ibiza and Majorca. The main strip along the beach is thick with touts luring visitors into their establishments, with promises of free admission and a variety of drinks offers. Holidaymakers can choose from a number of watersports, particularly on the busy Dolphin and Agapi beaches. Options include banana boat and jet-ski rides, water skiing and para-sailing, as well as gentle pedalo outings. Many beaches have daytime bars that play music on the sand. Football and volleyball are popular activities too. Otherwise, visitors can enjoy forest hikes and archaeological-site visits. 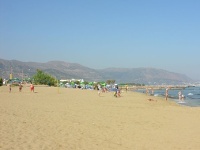 Although Malia has a long, wide stretch of beach, it becomes heavily crowded during the peak holiday season. Also, the resort's popularity among young party goers means it isn't the best option for a family holiday.